Nestled in the heart of Merida, Mansión Mérida is an ornate manor on the Yucatan Peninsula boasting a past rich with history. Dating back to 1644 and once owned by famed Governor Rodrigo Flores de Aldana, this elegant resort features Belle Epoque architecture and overlooks the leafy palm trees and exhilarating streets of the city. The magnificent chandeliers, plush European furniture, and well-appointed suites create a truly glamorous atmosphere while the five-year-long renovations enhance the stunning original state of the mansion. Considered a Historical Monument, this Yucatan hotel is just moments away from San Idelfonso’s Cathedral and a variety of celebrated restaurants, vibrant nightlife, and Yucatan tradition. Each of the 14 suites at this historic hotel feature unique hand-painted walls, deluxe bedding, and modern amenities that truly compliment the outdoor pool and sprawling tropical gardens outside. Whether enjoying the local cuisine made with fresh, locally sourced ingredients at The Mansión Mérida Restaurant, sipping a specialty cocktail at the outdoor Bistro, fitting in a quick workout at the fully equipped gym, or relaxing with a massage complete with Bougainvillea flower oil, Mansión Mérida has something for every guest. Mansión Mérida On The Park, a member of Historic Hotels Worldwide since 2015, dates back to 1644. 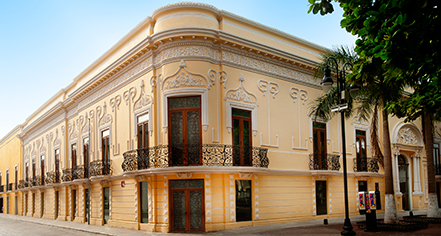 The mansion at one point served as the site for “The Union,” Yucatan’s premier social club. Airport Transportation: An airport shuttle may be arranged through the hotel's concierge, USD 38 per vehicle (one way). Cancellation Policy: Cancellations not accepted. Change of dates accepted paying the difference between fares, if applicable, plus a fee of USD 50 plus taxes. Deposit: 100% of the stay will be charged at time of booking to the credit or debit card provided in the reservation. Extra Person Fees: 3rd person has an extra cost of $65 USD per night including taxes; subject to availability at time of booking. Hotel/Resort Fees & Taxes: All rates are subject to 16% of VAT and 3% lodging tax + $5 USD of service charge per night. Payment: All forms of payment are accepted. Payment is required at time of booking. Visa, MasterCard and Amex are accepted. Nestled in the heart of Merida, Mansión Mérida is an ornate manor on the Yucatan Peninsula boasting a past rich with history. Dating back to 1644 and once owned by famed Governor Rodrigo Flores de Aldana, this elegant resort features Belle Epoque architecture and overlooks the leafy palm trees and exhilarating streets of the city. 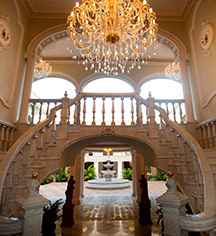 Learn more about the History of Mansion Merida On the Park .